At a very fundamental level, B of A's second quarter was a huge success. Here are three critical examples. Since the financial crisis, many investors -- myself included -- have developed a persistent, negative view of Bank of America (NYSE:BAC). That's fine for the media and the general public, but as investors, we must force ourselves to rise above our prejudgments and view a stock for what it really is, in black and white, today and in the future. Starting from that blank canvas, there's a whole lot to like in Bank of America's second-quarter results. Here are three things that really stood out to me. 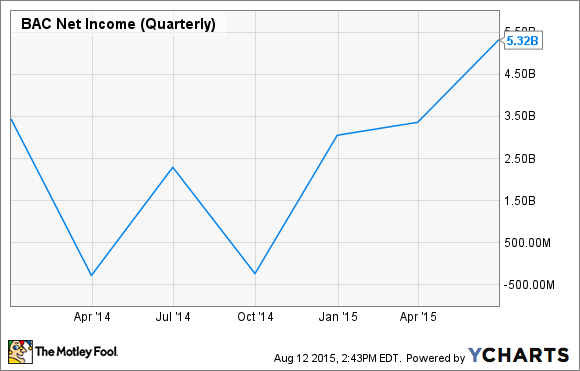 The biggest surprise in Bank of America's second-quarter results had to be its earnings. The bank reported profits of $5.3 billion in the second quarter, more than double the number reported in the 2014 second quarter. That $5.3 billion works out to $0.45 per share, blowing away Wall Street's $0.36 per share expectation. BAC Net Income (Quarterly) data by YCharts. It's great news that the bank was able to churn out such a headline-grabbing jump in profits. However, I think it's important for us to remember that Bank of America is still a turnaround story -- the bank still lags industry leaders Wells Fargo (NYSE:WFC) and JPMorgan Chase (NYSE:JPM) by a decent margin. Wells and JPMorgan reported return on equity of 12.2% and 10.5%, respectively, both easily beating Bank of America's 8.5%. So, yes, Bank of America still has a ways to go before anyone would call it an elite performer. But that doesn't mean the bank and its investors shouldn't be thrilled with the quarter's results. I view it as a very positive sign that could prove to be the start of a very positive trend. Banks are able to gather cheap customer deposits and redeploy those funds into other investments like loans. Because the deposits are so cheap, banks can make huge profits on the thinnest of margins. The key, though, is stability and predictability. If deposits rise or fall too quickly -- in terms of balances or yields -- those thin margins can quickly disappear. And that brings us to the second quarter, where JPMorgan saw its deposit base drop by over 6%, and Wells Fargo saw its deposits sink by 1.4%. In dollar terms, that's an $89.7 billion decline at JPMorgan, and a $18.1 billion decline at Wells. Bank of America, on the other hand, saw its deposit base remain more or less flat, dropping by a relatively tiny $674 million. The dollar declines at JPMorgan and Wells Fargo were 133 times and 27 times greater, respectively. JPMorgan and Wells Fargo have blamed seasonality and other generic causes for the decline, and while those things may be true, Bank of America was still able to maintain stability in its deposit base over the same period. To me, protecting the deposit base is one of the absolute, most critical tasks a bank must do. And in the second quarter, Bank of America did it better than both JPMorgan and Wells Fargo. Since the end of the financial crisis, many banks have begun to diversify their loan portfolios by aggressively pursuing loans to businesses to fund growth, working capital, and fixed-asset needs. In the industry, these loans are called commercial and industrial loans, or simply C&I loans. B of A is the largest holder of C&I loans in the country, with $225 billion on the books. Having that large portfolio is definitely a good thing, so long as those loans are being repaid on time. When loans go bad, banks can get into hot water very fast. A great example is the sub-prime mortgage portfolio B of A acquired from CountryWide just before the financial crisis. That relatively small portfolio of loans nearly collapsed the entire bank. With that in mind, B of A not only owns the largest portfolio of C&I loans, its portfolio is also performing better than those of any of the other mega banks. We can measure this using the ratio of non-performing C&I loans -- those that are severely past due -- as a percentage of the whole C&I portfolio. It's worth pointing out that non-performing C&I loans have been on the rise across the industry since the 2014 fourth quarter. B of A's portfolio just hasn't deteriorated as much as the others. From the 2015 first quarter to second quarter, B of A's C&I non-performing loans increased by $232 million. For context, Wells Fargo's C&I non-performing loans jumped $433 million during the same period. Bank of America's C&I portfolio may be doing well relative to its peers right now, but this overarching trend is worth keeping an eye on. Whatever your personal feelings on Bank of America may be, the bank's second quarter was an unbiased success. But that one three-month period does not, of course, mean the bank is back on top just yet. Its profits are much improved, but they are still not up to par with other banks. Its legal problems may be in the rear-view mirror, but the bank still has lingering efficiency issues to work through. There is still work to be done, yes, but for the first time in a long while, there is also reason to celebrate.